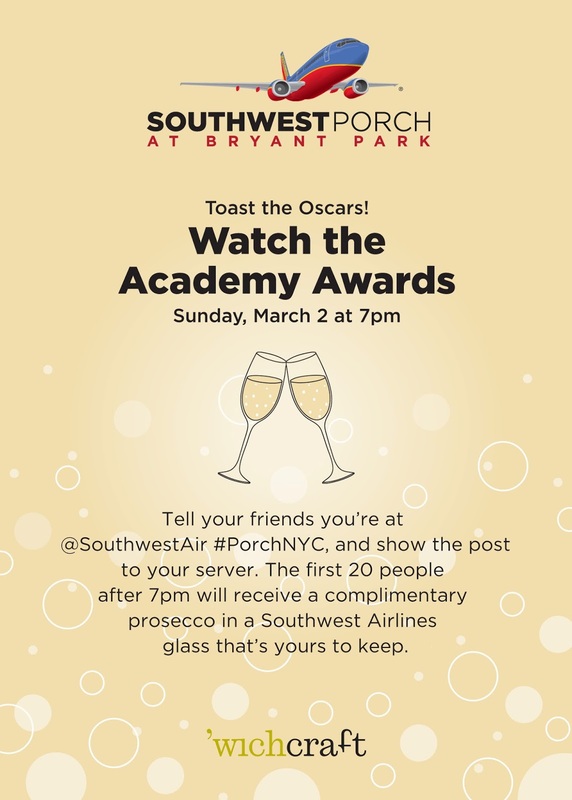 Watch America's favorite award show in style at the Southwest Porch this Sunday. We'll have the heaters on, and the fire pit will be blazing to keep you cozy and warm. You'll be able to kick back and even order sips and snacks from 'wichcraft like the blackened chicken sandwich or the zucchini and hummus dip. To sweeten the deal, we're also offering one complimentary glass of prosecco to the first 20 people to tell their friends they're at the Southwest Porch after 7pm. Just share a message on Facebook, Twitter, or Instagram with the tags @SouthwestAir #PorchNYC, and show the message to your server. Your bubbly will come in a complimentary Southwest Airlines glass that's yours to keep at the end of the night. So grab a few friends, and come critique the fashion and film en masse on Sunday at Southwest Porch in Bryant Park! 7pm: Oscars Red Carpet Live!